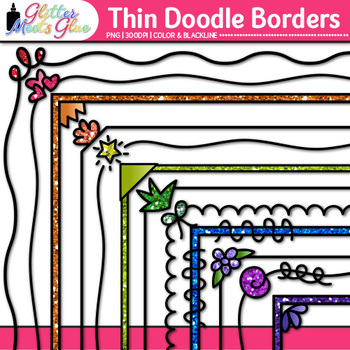 Thin Doodle Border Clip Art: Create classroom resources that twinkle with this sparkly pack of clipart. Dress up your lessons with flair by overlapping one of these borders on worksheet or handout. Make your classroom posters and signs shine with a touch of glitter by adding some of these frames. Clip art (or "clipart") are digital images that can be imported into graphic design or desktop publishing software to create documents such as for classroom use. These illustrations can be hand drawn images that have been scanned into the computer or fully digital images drawn on a tablet and colored using graphic design software. Classroom teachers use clip art to decorate their bulletin board, spice up a PowerPoint presentation, design worksheets and handouts, compose classroom newsletters, decorate your classroom, and create a class schedule with pictures for special needs students. Like what you see and want all the clipart I've created? BUY MY ENTIRE STORE on a flash drive! Would you also like to purchase a license so your colleagues may use this clipart, too? I offer a 10% off discount on all additional copies. Please use the honor system here as you would in your own classroom. Visit my sister store, PHOTO CLIPZ for more educational clipart!